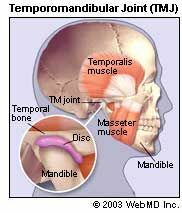 TMJ is a pain. Literally. It's a problem with your TM joint, which connects your lower jaw to your skull. You might feel: Pain in or around your ears. Trouble opening your mouth wide. Jaw or neck pain. Even ringing in the ears. What's causing it? Grinding your teeth. Clenching your jaw. Stress. Poor posture. Arthritis. An injury. Women get it more than men. Doctors don't know why. Think you have it? Ask your dentist or doctor. Many other conditions cause similar symptoms -- like tooth decay, sinus problems, arthritis, or gum disease. To figure out what’s causing yours, the dentist will ask about your health history and conduct a physical exam. Don't rest your chin on your hand. Don’t hold the phone between your shoulder and ear. Practice good posture to reduce neck and facial pain.